We’ve all uttered this phrase at one point or another in our lifetime. Well maybe we’ve just thought about saying it, but we’re inherently wired to feel it. We love to compete with one another no matter what the circumstances are, but let’s face it, seeing who can do the most one armed push-ups at the office is getting old, and frankly Erick is sick of losing. It’s time for some fresh meat. Am I right? What, you think you can come up with something better? Then prove it. I dare you. That’s where Vancouver, BC-based Strutta comes in. They’re taking user-generated video content and melding it with casual gaming to create the online version of a spectator sport. The name alone should tip you off to what they’re all about. Strut your stuff. Show the world what you’re good at and get a chance to smoke the competition. Or if you’re more of a spectator, just spend time voting for the best players in different games to crank up your judge points (yes judges get points, too). Think of Strutta as a federated body for online competitions, kind of like what the WWF is to wrestling, only on Strutta you can compete against the entire world in anything you see fit. Strutta even lets you compete on behalf of your city, your state, and your country kind of like a web Olympian. To play in a game, upload a video that you created or starred in, or login to your YouTube account from Strutta’s site and select videos from there. 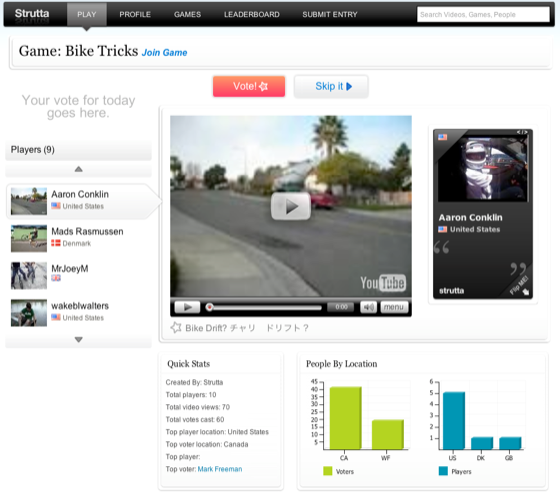 Compete in an existing game on Strutta, or create a new one to feature your best skills and drop in your video. You can keep track of your stats on Strutta’s dynamic leaderboards and as soon as you see your rank dropping, just swap out your video for a new one to show more of your skills or up the star-quality of your performance. Also, if you don’t want to play directly on Strutta’s site you’ll be able to simply embed the game you’re competing in onto other sites and social networks, like MySpace and Facebook, and have your friends vote for you, there. So, I challenge everyone to a game: I want you all to do your best impression of Michael. Seriously. Let’s see what you’ve got.